Elderly patients with dementia-related psychosis treated with antipsychotic drugs are at an increased risk of death. olanzapine is not approved for the treatment of patients with dementia-related psychosis (5.1, 5.14, 17.2). Efficacy was established in two 6-week clinical trials in adults. (14.2). Maintenance efficacy has not been systematically evaluated. Efficacy was established with Symbyax (olanzapine and fluoxetine combination) in adults; refer to the product label for Symbyax. Lower starting dose recommended in debilitated or pharmacodynamically sensitive patients or patients with predisposition to hypotensive reactions, or with potential for slowed metabolism.(2.1). Olanzapine may be given without regard to meals. (2.1). Olanzapine monotherapy is not indicated for the treatment of depressive episodes associated with bipolar I disorder or treatment resistant depression. Pediatric Use: Safety and effectiveness of olanzapine in children <13 years of age have not been established. Safety and effectiveness of olanzapine and fluoxetine in combination in children < 10 years of age have not been established. (8.4). 17.1 Information on Medication Guide 17.2 Elderly Patients with Dementia-Related Psychosis: Increased Mortality and Cerebrovascular Adverse Events (CVAE), Including Stroke 17.3 Neuroleptic Malignant Syndrome (NMS) 17.4 Drug Reaction with Eosinophilia and Systemic Symptoms (DRESS) 17.5 Hyperglycemiaand Diabetes Mellitus 17.6 Dyslipidemia 17.7 Weight Gain 17.8 Orthostatic Hypotension 17.9 Potential for Cognitive and Motor Impairment 17.10 Body Temperature Regulation 17.11 Concomitant Medication 17.12 Alcohol 17.13 Phenylketonurics 17.14 Use in Specific Populations 17.15 Need for Comprehensive Treatment Program in Pediatric Patients What is the most important information I should know about olanzapine orally disintegrating tablets? What are olanzapine orally disintegrating tablets? What should I tell my doctor before taking olanzapineorally disintegratingtablets? How should I take olanzapineorally disintegrating tablets? What should I avoid while taking olanzapineorally disintegrating tablets? What are the possible side effects of olanzapineorally disintegrating tablets? How should I store olanzapineorally disintegrating tablets? General information about olanzapineorally disintegratingtablets What are the ingredients in olanzapine orally disintegrating tablets? Oral olanzapine is indicated for the treatment of schizophrenia. Efficacy was established in three clinical trials in adult patients with schizophrenia: two 6-week trials and one maintenance trial. In adolescent patients with schizophrenia (ages 13 to 17), efficacy was established in one 6-week trial [see Clinical Studies (14.1)]. Oral olanzapine is indicated for acute treatment of manic or mixed episodes associated with bipolar I disorder and maintenance treatment of bipolar I disorder. Efficacy was established in three clinical trials in adult patients with manic or mixed episodes of bipolar I disorder: two 3- to 4-week trials and one monotherapy maintenance trial. In adolescent patients with manic or mixed episodes associated with bipolar I disorder (ages 13 to 17), efficacy was established in one 3-week trial [see Clinical Studies (14.2)]. When deciding among the alternative treatments available for adolescents, clinicians should consider the increased potential (in adolescents as compared with adults) for weight gain and dyslipidemia. Clinicians should consider the potential long-term risks when prescribing to adolescents, and in many cases this may lead them to consider prescribing other drugs first in adolescents [see Warnings and Precautions (5.5) ]. Oral olanzapine is indicated for the treatment of manic or mixed episodes associated with bipolar I disorder as an adjunct to lithium or valproate. Efficacy was established in two 6-week clinical trials in adults. The effectiveness of adjunctive therapy for longer-term use has not been systematically evaluated in controlled trials [see Clinical Studies (14.2)]. Olanzapine monotheraphy is not indicated for the treatment of depressive episodes associated with bipolar I disorder. Dose Selectionâ€” Oral olanzapine should be administered on a once-a-day schedule without regard to meals, generally beginning with 5 to 10 mg initially, with a target dose of 10 mg/day within several days. Further dosage adjustments, if indicated, should 4 generally occur at intervals of not less than 1 week, since steady state for olanzapine would not be achieved for approximately 1 week in the typical patient. When dosage adjustments are necessary, dose increments/decrements of 5 mg QD are recommended. Maintenance Treatment â€”The effectiveness of oral olanzapine, 10 mg/day to 20 mg/day, in maintaining treatment response in schizophrenic patients who had been stable on olanzapine for approximately 8 weeks and were then followed for relapse has been demonstrated in a placebo-controlled trial [see Clinical Studies (14.1)]. The physician who elects to use olanzapine for extended periods should periodically reevaluate the long-term usefulness of the drug for the individual patient. Maintenance Treatment â€” The efficacy of olanzapine for the maintenance treatment of schizophrenia in the adolescent population has not been systematically evaluated; however, maintenance efficacy can be extrapolated from adult data along with comparisons of olanzapine pharmacokinetic parameters in adult and adolescent patients. Thus, it is generally recommended that responding patients be continued beyond the acute response, but at the lowest dose needed to maintain remission. Patients should be periodically reassessed to determine the need for maintenance treatment. Maintenance Monotherapy â€” The benefit of maintaining bipolar I patients on monotherapy with oral olanzapine at a dose of 5 to 20 mg/day, after achieving a responder status for an average duration of 2 weeks, was demonstrated in a controlled trial [see Clinical Studies (14.2)]. The physician who elects to use olanzapine for extended periods should periodically reevaluate the long-term usefulness of the drug for the individual patient. Dose Selectionâ€” Oral olanzapine should be administered on a once-a-day schedule without regard to meals with a recommended starting dose of 2.5 or 5 mg, with a target dose of 10 mg/day. Efficacy in adolescents with bipolar I disorder (manic or mixed episodes) was demonstrated based on a flexible dose range of 2.5 to 20 mg/day in clinical trials, with a mean modal dose of 10.7 mg/day (mean dose of 8.9 mg/day). When dosage adjustments are necessary, dose increments/decrements of 2.5 or 5 mg are recommended. Maintenance Treatmentâ€” The efficacy of olanzapine for the maintenance treatment of bipolar I disorder in the adolescent population has not been evaluated; however, maintenance efficacy can be extrapolated from adult data along with comparisons of olanzapine pharmacokinetic parameters in adult and adolescent patients. Thus, it is generally recommended that responding patients be continued beyond the acute response, but at the lowest dose needed to maintain remission. Patients should be periodically reassessed to determine the need for maintenance treatment. After opening sachet, peel back foil on blister. Do not push tablet through foil. Immediately upon opening the blister, using dry hands, remove tablet and place entire olanzapine orally disintegrating tabletin the mouth. Tablet disintegration occurs rapidly in saliva so it can be easily swallowed with or without liquid. 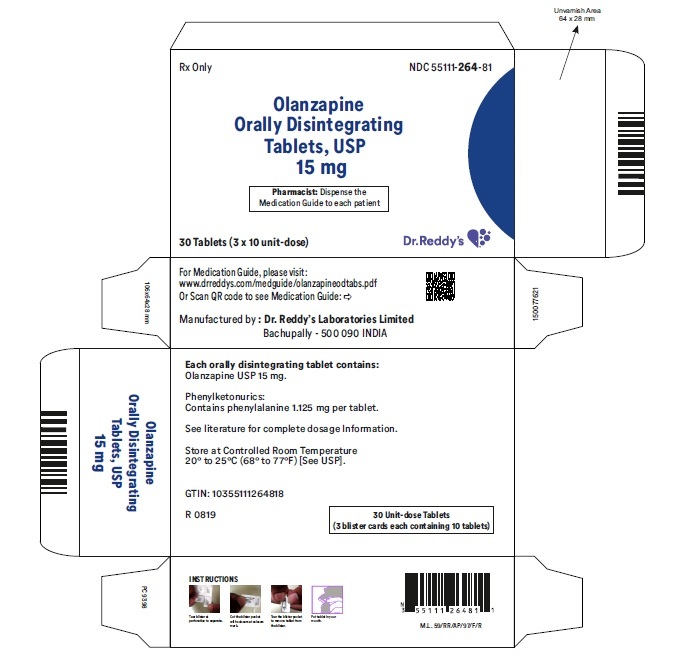 The starting dose of oral olanzapine 2.5 to 5 mg with fluoxetine 20 mg should be used for patients with a predisposition to hypotensive reactions, patients with hepatic impairment, or patients who exhibit a combination of factors that may slow the metabolism of olanzapine or fluoxetine in combination (female gender, geriatric age, nonsmoking status), or those patients who may be pharmacodynamically sensitive to olanzapine. Dosing modification may be necessary in patients who exhibit a combination of factors that may slow metabolism. When indicated, dose escalation should be performed with caution in these patients. Olanzapine and fluoxetine in combination have not been systematically studied in patients over 65 years of age or in patients under < 10 years of age [see Warnings and Precautions (5.14) , Drug Interactions (7), and Clinical Pharmacology (12.3)]. Olanzapine orally disintegrating tablets 5 mg are yellow-colored, capsule-shaped tablets, flat on one side and concave on the other side, debossed with R-262 on the flat side and plain on the concave side. Olanzapine orally disintegrating tablets 10 mg are yellow-colored, capsule-shaped tablets, flat on one side and concave on the other side, debossed with R-263 on the flat side and plain on the concave side. Olanzapine orally disintegrating tablets 15 mg are yellow-colored, capsule-shaped tablets, flat on one side and concave on the other side, debossed with R-264 on the flat side and plain on the concave side. Olanzapine orally disintegrating tablets 20 mg are yellow-colored, capsule-shaped tablets, flat on one side and concave on the other side, debossed with R-265 on the flat side and plain on the concave side. Elderly patients with dementia-related psychosis treated with antipsychotic drugs are at an increased risk of death. Olanzapine is not approved for the treatment of patients with dementia-related psychosis [see Boxed Warning, Warnings and Precautions (5.14), and Patient Counseling Information (17.2)]. Cerebrovascular adverse events (e.g., stroke, transient ischemic attack), including fatalities, were reported in patients in trials of olanzapine in elderly patients with dementia-related psychosis. In placebo-controlled trials, there was a significantly higher incidence of cerebrovascular adverse events in patients treated with olanzapine compared to patients treated with placebo. Olanzapine is not approved for the treatment of patients with dementia-related psychosis [see Boxed Warningand Patient Counseling Information (17.2)]. If a patient requires antipsychotic drug treatment after recovery from NMS, the potential reintroduction of drug therapy should be carefully considered. The patient should be carefully monitored, since recurrences of NMS have been reported. [see Patient Counseling Information (17.3)]. Hyperglycemia and Diabetes MellitusPhysicians should consider the risks and benefits when prescribing olanzapine to patients with an established diagnosis of diabetes mellitus, or having borderline increased blood glucose level (fasting 100 to 126 mg/dL, nonfasting 140 to 200 mg/dL). Patients taking olanzapine should be monitored regularly for worsening of glucose control. Patients starting treatment with olanzapine should undergo fasting blood glucose testing at the beginning of treatment and periodically during treatment. Any patient treated with atypical antipsychotics should be monitored for symptoms of hyperglycemia including polydipsia, polyuria, polyphagia, and weakness. Patients who develop symptoms of hyperglycemia during treatment with atypical antipsychotics should undergo fasting blood glucose testing. In some cases, hyperglycemia has resolved when the atypical antipsychotic was discontinued; however, some patients required continuation of anti-diabetic treatment despite discontinuation of the suspect drug. [see Patient Counseling Information (17.5)]. DyslipidemiaUndesirable alterations in lipids have been observed with olanzapine use. Clinical monitoring, including baseline and periodic follow-up lipid evaluations in patients using olanzapine, is recommended. [see Patient Counseling Information (17.5)]. Olanzapine Monotherapy in Adults â€” In an analysis of 5 placebo-controlled olanzapine monotherapy studies with treatment duration up to 12 weeks, olanzapine-treated patients had increases from baseline in mean fasting total cholesterol, LDL cholesterol, and triglycerides of 5.3 mg/dL, 3 mg/dL, and 20.8 mg/dL respectively compared to decreases from baseline in mean fasting total cholesterol, LDL cholesterol, and triglycerides of 6.1 mg/dL, 4.3 mg/dL, and 10.7 mg/dL for placebo-treated patients. For fasting HDL cholesterol, no clinically meaningful differences were observed between olanzapine-treated patients and placebo-treated patients. Mean increases in fasting lipid values (total cholesterol, LDL cholesterol, and triglycerides) were greater in patients without evidence of lipid dysregulation at baseline, where lipid dysregulation was defined as patients diagnosed with dyslipidemia or related adverse reactions, patients treated with lipid lowering agents, or patients with high baseline lipid levels. Olanzapine Monotherapy in Adolescents â€” The safety and efficacy of olanzapine have not been established in patients under the age of 13 years. In an analysis of 3 placebo-controlled olanzapine monotherapy studies of adolescents, including those with schizophrenia (6 weeks) or bipolar I disorder (manic or mixed episodes) (3 weeks), olanzapine-treated adolescents had increases from baseline in mean fasting total cholesterol, LDL cholesterol, and triglycerides of 12.9 mg/dL, 6.5 mg/dL, and 28.4 mg/dL, respectively, compared to increases from baseline in mean fasting total cholesterol and LDL cholesterol of 1.3 mg/dL and 1 mg/dL, and a decrease in triglycerides of 1.1 mg/dL for placebo-treated adolescents. For fasting HDL cholesterol, no clinically meaningful differences were observed between olanzapine-treated adolescents and placebo-treated adolescents. Olanzapine Monotherapy in Adults â€” In an analysis of 13 placebo-controlled olanzapine monotherapy studies, olanzapine-treated patients gained an average of 2.6 kg (5.7 lb), compared to an average 0.3 kg (0.6 lb) weight loss in placebo-treated patients with a median exposure of 6 weeks; 22.2% of olanzapine-treated patients gained at least 7% of their baseline weight, compared to 3% of placebo-treated patients, with a median exposure to event of 8 weeks; 4.2% of olanzapine-treated patients gained at least 15% of their baseline weight, compared to 0.3% of placebo-treated patients, with a median exposure to event of 12 weeks. Clinically significant weight gain was observed across all baseline Body Mass Index (BMI) categories. Discontinuation due to weight gain occurred in 0.2% of olanzapine-treated patients and in 0% of placebo-treated patients. Class Effectâ€” In clinical trial and/or postmarketing experience, events of leukopenia/neutropenia have been reported temporally related to antipsychotic agents, including olanzapine. Agranulocytosis has also been reported. Esophageal dysmotility and aspiration have been associated with antipsychotic drug use. Aspiration pneumonia is a common cause of morbidity and mortality in patients with advanced Alzheimerâ€™s disease. Olanzapine is not approved for the treatment of patients with Alzheimerâ€™s disease. During premarketing testing, seizures occurred in 0.9% (22/2500) of olanzapine-treated patients. There were confounding factors that may have contributed to the occurrence of seizures in many of these cases. Olanzapine should be used cautiously in patients with a history of seizures or with conditions that potentially lower the seizure threshold, e.g., Alzheimerâ€™s dementia. Olanzapine is not approved for the treatment of patients with Alzheimerâ€™s disease. Conditions that lower the seizure threshold may be more prevalent in a population of 65 years or older. Since olanzapine has the potential to impair judgment, thinking, or motor skills, patients should be cautioned about operating hazardous machinery, including automobiles, until they are reasonably certain that olanzapine therapy does not affect them adversely. [see Patient Counseling Information (17.9)]. Disruption of the bodyâ€™s ability to reduce core body temperature has been attributed to antipsychotic agents. 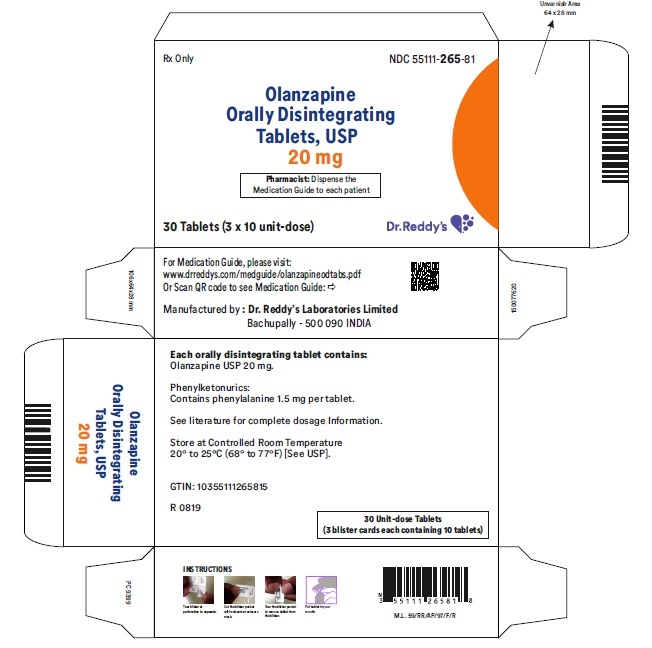 Appropriate care is advised when prescribing olanzapine for patients who will be experiencing conditions which may contribute to an elevation in core body temperature, e.g., exercising strenuously, exposure to extreme heat, receiving concomitant medication with anticholinergic activity, or being subject to dehydration. [see Patient Counseling Information (17.9)]. In 5 placebo-controlled studies of olanzapine in elderly patients with dementia-related psychosis (n=1184), the following treatment-emergent adverse reactions were reported in olanzapine-treated patients at an incidence of at least 2% and significantly greater than placebo-treated patients: falls, somnolence, peripheral edema, abnormal gait, urinary incontinence, lethargy, increased weight, asthenia, pyrexia, pneumonia, dry mouth and visual hallucinations. The rate of discontinuation due to adverse reactions was greater with olanzapine than placebo (13% vs 7%). Elderly patients with dementia-related psychosis treated with olanzapine are at an increased risk of death compared to placebo. Olanzapine is not approved for the treatment of patients with dementia-related psychosis [see Boxed Warningand Warningsand Precautions (5.1)and Patient Counseling Information (17.2)]. Olanzapine has not been evaluated or used to any appreciable extent in patients with a recent history of myocardial infarction or unstable heart disease. Patients with these diagnoses were excluded from premarketing clinical studies. Because of the risk of orthostatic hypotension with olanzapine, caution should be observed in cardiac patients [see Warnings and Precautions (5.7) ]. In placebo-controlled olanzapine monotherapy studies in adolescent patients (up to 6 weeks) with schizophrenia or bipolar I disorder (manic or mixed episodes), changes from normal to high in prolactin concentrations were observed in 47% of olanzapinetreated patients compared to 7% of placebo-treated patients. In a pooled analysis from clinical trials including 454 adolescents treated with olanzapine, potentially associated clinical manifestations included menstrual-related events1 (1% [2/168] of females), sexual function-related events2 (0.7% [3/454] of females and males), and breast-related events3 (2% [3/168] of females, 2% [7/286] of males) [see Use in Specific Populations (8.4)]. 3Based on a search of the following terms: breast discharge, enlargement or swelling, galactorrhea, gynecomastia, and lactation disorder. When using olanzapine and fluoxetine in combination, also refer to the Warnings and Precautions section of the package insert for Symbyax. When using olanzapine in combination with lithium or valproate, the prescriber should refer to the Warnings and Precautions sections of the package inserts for lithium or valproate. [See Drug Interactions (7)]. The information below for olanzapine is derived from a clinical trial database for olanzapine consisting of 10,504 adult patients with approximately 4765 patient-years of exposure to oral olanzapine. This database includes: (1) 2500 patients who participated in multiple-dose oral olanzapine premarketing trials in schizophrenia and Alzheimerâ€™s disease representing approximately 1122 patient-years of exposure as of February 14, 1995; (2) 182 patients who participated in oral olanzapine premarketing bipolar I disorder (manic or mixed episodes) trials representing approximately 66 patient-years of exposure; (3) 191 patients who participated in an oral olanzapine trial of patients having various psychiatric symptoms in association with Alzheimerâ€™s disease representing approximately 29 patient-years of exposure; (4) 5788 additional patients from 88 oral olanzapine clinical trials as of December 31, 2001; (5) 1843 additional patients from 41 olanzapine clinical trials as of October 31, 2011. Also included below is information from the premarketing 6-week clinical study database for olanzapine in combination with lithium or valproate, consisting of 224 patients who participated in bipolar I disorder (manic or mixed episodes) trials with approximately 22 patient-years of exposure. Certain portions of the discussion below relating to objective or numeric safety parameters, namely, dose-dependent adverse reactions, vital sign changes, weight gain, laboratory changes, and ECG changes are derived from studies in patients with schizophrenia and have not been duplicated for bipolar I disorder (manic or mixed episodes). However, this information is also generally applicable to bipolar I disorder (manic or mixed episodes). The following findings are based on premarketing trials of oral olanzapine for Schizophrenia, Bipolar I Disorder (manic or mixed episodes), a subsequent trial of patients having various psychiatric symptoms in association with Alzheimerâ€™s disease, and premarketing combination trials. a Personality disorder is the COSTART term for designating non-aggressive objectionable behavior. Dose Dependency of Adverse ReactionsA dose group difference has been observed for fatigue, dizziness, weight gain and prolactin elevation. In a single 8-week randomized, double-blind, fixed-dose study comparing 10 (N=199), 20 (N=200) and 40 (N=200) mg/day of oral olanzapine in adult patients with schizophrenia or schizoaffective disorder, incidence of fatigue (10 mg/day: 1.5%; 20 mg/day: 2.1%; 40 mg/day: 6.6%) was observed with significant differences between 10 vs 40 and 20 vs 40 mg/day. Lymphatic System â€” Infrequent: thrombocytopenia. Skin and Appendages â€” Infrequent: alopecia. Special Senses â€” Infrequent: abnormality of accommodation, dry eyes; Rare: mydriasis. Commonly Observed Adverse Reactions in Oral Olanzapine Short-Term, Placebo-Controlled Trials: Adverse reactions in adolescent patients treated with oral olanzapine (doses â‰¥2.5 mg) reported with an incidence of 5% or more and reported at least twice as frequently as placebo-treated patients are listed in Table 21. Adverse Reactions Occurring at an Incidence of 2% or More among Oral Olanzapine-Treated Patients in Short-Term (3 to 6 weeks), Placebo-Controlled Trials: Adverse reactions in adolescent patients treated with oral olanzapine (doses â‰¥2.5 mg) reported with an incidence of 2% or more and greater than placebo are listed in Table 22. Vital Sign Changes â€” Oral olanzapine was associated with orthostatic hypotension and tachycardia in clinical trials. [see Warnings and Precautions (5)]. Olanzapine Monotherapy in Adolescents: In placebo-controlled clinical trials of adolescent patients with schizophrenia or bipolar I disorder (manic or mixed episodes), greater frequencies for the following treatment-emergent findings, at anytime, were observed in laboratory analytes compared to placebo: elevated ALT (â‰¥3 X ULN in patients with ALT at baseline <3 X ULN), (12% vs 2%); elevated AST (28% vs 4%); low total bilirubin (22% vs 7%); elevated GGT (10 % vs 1%); and elevated prolactin (47% vs 7%). ECG Changes â€” In pooled studies of adults as well as pooled studies of adolescents, there were no significant differences between olanzapine and placebo in the proportions of patients experiencing potentially important changes in ECG parameters, including QT, QTc (Fridericia corrected), and PR intervals. Olanzapine use was associated with a mean increase in heart rate compared to placebo (adults: +2.4 beats per minute vs no change with placebo; adolescents: +6.3 beats per minute vs -5.1 beats per minute with placebo). This increase in heart rate may be related to olanzapineâ€™s potential for inducing orthostatic changes [see Warnings and Precautions (5.7)]. Adverse reactions reported since market introduction that were temporally (but not necessarily causally) related to olanzapine therapy include the following: allergic reaction (e.g., anaphylactoid reaction, angioedema, pruritus or urticaria), cholestatic or mixed liver injury, diabetic coma, diabetic ketoacidosis, discontinuation reaction (diaphoresis, nausea or vomiting, Drug Reaction with Eosinophilia and Systemic Symptoms (DRESS)), hepatitis, jaundice, neutropenia, pancreatitis, priapism, rash, restless legs syndrome, rhabdomyolysis, stuttering1 and venous thromboembolic events (including pulmonary embolism and deep venous thrombosis). Random cholesterol levels of â‰¥240 mg/dL and random triglyceride levels of â‰¥1000 mg/dL have been reported. Inducers of CYP1A2 or Glucuronyl Transferase â€” Omeprazole and rifampin, may cause an increase in olanzapine clearance. Lithium â€” Multiple doses of olanzapine (10 mg for 8 days) did not influence the kinetics of lithium. Therefore, concomitant olanzapine administration does not require dosage adjustment of lithium. [see Warnings and Precautions (5.16)]. Valproate â€”Olanzapine (10 mg daily for 2 weeks) did not affect the steady state plasma concentrations of valproate. Therefore, concomitant olanzapine administration does not require dosage adjustment of valproate. [see Warnings and Precautions (5.16)]. Diazepam â€” Olanzapine did not influence the pharmacokinetics of diazepam or its active metabolite N-desmethyldiazepam. However, diazepam co-administered with olanzapine increased the orthostatic hypotension observed with either drug given alone. [see Drug Interactions (7.1)]. Non-Teratogenic Effects - Neonates exposed to antipsychotic drugs (including olanzapine), during the third trimester of pregnancy are at risk for extrapyramidal and/or withdrawal symptoms following delivery. There have been reports of hypertonia, hypotonia, tremor, somnolence, respiratory distress and feeding disorder in these neonates. These complications have varied in severity; while in some cases symptoms have been self-limited, in other cases neonates have required intensive care unit support and prolonged hospitalization. The safety and effectiveness of oral olanzapine in the treatment of schizophrenia and manic or mixed episodes associated with bipolar I disorder were established in short-term studies in adolescents (ages 13 to 17 years). Use of olanzapine in adolescents is supported by evidence from adequate and well-controlled studies of olanzapine in which 268 adolescents received olanzapine in a range of 2.5 to 20 mg/day [see Clinical Studies (14.1, 14.2)]. Recommended starting dose for adolescents is lower than that for adults [see Dosage and Administration (2.1, 2.2)]. Compared to patients from adult clinical trials, adolescents were likely to gain more weight, experience increased sedation, and have greater increases in total cholesterol, triglycerides, LDL cholesterol, prolactin and hepatic aminotransferase levels [see Warnings and Precautions (5 .5, 5.15, 5.17) and Adverse Reactions (6.3)]. When deciding among the alternative treatments available for adolescents, clinicians should consider the increased potential (in adolescents as compared with adults) for weight gain and dyslipidemia. Clinicians should consider the potential long-term risks when prescribing to adolescents, and in many cases this may lead them to consider prescribing other drugs first in adolescents [see Indications and Usage (1.1, 1.2)]. Of the 2500 patients in premarketing clinical studies with oral olanzapine, 11% (263) were 65 years of age or over. In patients with Schizophrenia, there was no indication of any different tolerability of olanzapine in the elderly compared to younger patients. Studies in elderly patients with dementia-related psychosis have suggested that there may be a different tolerability profile in this population compared to younger patients with Schizophrenia. Elderly patients with dementia-related psychosis treated with olanzapine are at an increased risk of death compared to placebo. In placebo-controlled studies of olanzapine in elderly patients with dementia-related psychosis, there was a higher incidence of cerebrovascular adverse events (e.g., stroke, transient ischemic attack) in patients treated with olanzapine compared to patients treated with placebo. Olanzapine is not approved for the treatment of patients with dementia-related psychosis. Also, the presence of factors that might decrease pharmacokinetic clearance or increase the pharmacodynamic response to olanzapine should lead to consideration of a lower starting dose for any geriatric patient [see Boxed Warning, Dosage and Administration (2.1) and Warnings and Precautions (5.1)]. In postmarketing reports of overdose with olanzapine alone, symptoms have been reported in the majority of cases. In symptomatic patients, symptoms with â‰¥10% incidence included aggressiveness, dysarthria, tachycardia, various extrapyramidal symptoms, and reduced level of consciousness ranging from sedation to coma. Among less commonly reported symptoms were the following potentially medically serious reactions: aspiration, cardiopulmonary arrest, cardiac arrhythmias (such as supraventricular tachycardia and 1 patient experiencing sinus pause with spontaneous resumption of normal rhythm), delirium, possible neuroleptic malignant syndrome, respiratory depression/arrest, convulsion, hypertension, and hypotension. Reports of fatality in association with overdose of olanzapine alone have been received. 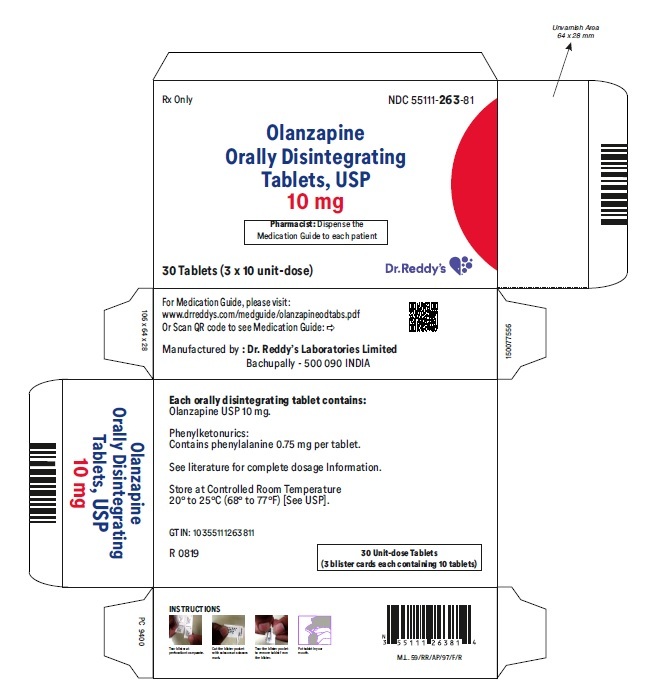 In 1 case of death, the amount of acutely ingested olanzapine was reported to be possibly as low as 450 mg of oral olanzapine; however, in another case, a patient was reported to survive an acute olanzapine ingestion of approximately 2 g of oral olanzapine. Olanzapine orally disintegrating tablets are intended for oral administration only. 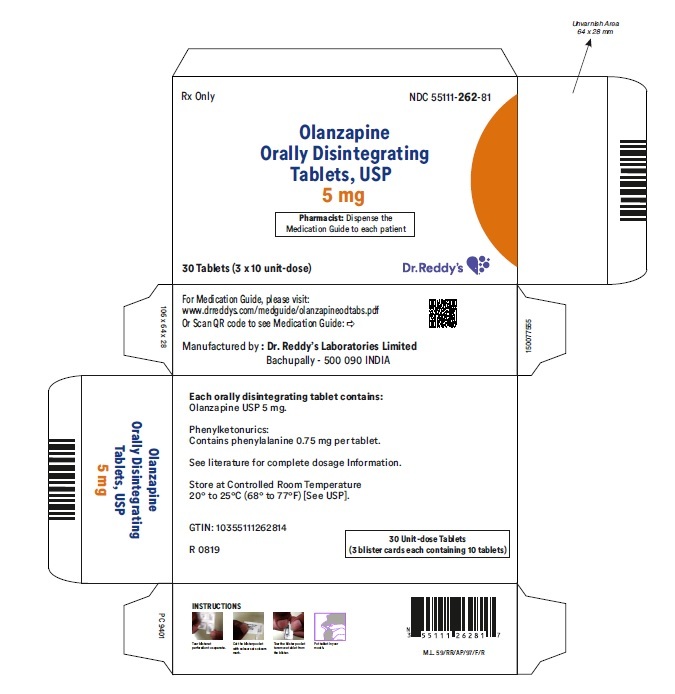 Each orally disintegrating tablet contains olanzapine USP equivalent to 5 mg (16 µmol), 10 mg (32 µmol), 15 mg (48 µmol) or 20 mg (64 µmol). It begins disintegrating in the mouth within seconds, allowing its contents to be subsequently swallowed with or without liquid. Olanzapine orally disintegrating tablets also contains the following inactive ingredients: aspartame, colloidal silicon dioxide, crospovidone, magnesium stearate, mannitol, microcrystalline cellulose and guar gum (Avicel CE-15), microcrystalline cellulose (Avicel PH 101), microcrystalline cellulose (Avicel PH 112), pregelatinized starch and sodium lauryl sulphate. The mechanism of action of olanzapine, as with other drugs having efficacy in schizophrenia, is unknown. However, it has been proposed that this drugâ€™s efficacy in schizophrenia is mediated through a combination of dopamine and serotonin type 2 (5HT2) antagonism. The mechanism of action of olanzapine in the treatment of acute manic or mixed episodes associated with bipolar I disorder is unknown. 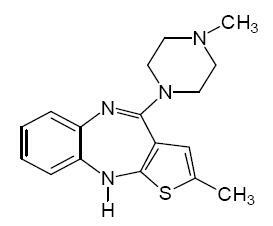 Olanzapine binds with high affinity to the following receptors: serotonin 5HT2A/2C, 5HT6 (Ki=4, 11, and 5 nM, respectively), dopamine D1-4 (Ki=11-31 nM), histamine H1 (Ki=7 nM), and adrenergic Î±1 receptors (Ki=19 nM). Olanzapine is an antagonist with moderate affinity binding for serotonin 5HT3 (Ki=57 nM) and muscarinic M1-5 (Ki=73, 96, 132, 32, and 48 nM, respectively). Olanzapine binds weakly to GABAA, BZD, and Î² adrenergic receptors (Ki>10 Î¼M). Antagonism at receptors other than dopamine and 5HT2 may explain some of the other therapeutic and side effects of olanzapine. Olanzapineâ€™s antagonism of muscarinic M1-5 receptors may explain its anticholinergic-like effects. Olanzapineâ€™s antagonism of histamine H1 receptors may explain the somnolence observed with this drug. Olanzapineâ€™s antagonism of adrenergic Î±1 receptors may explain the orthostatic hypotension observed with this drug. Olanzapine displays linear kinetics over the clinical dosing range. Its half-life ranges from 21 to 54 hours (5th to 95th percentile; mean of 30 hr), and apparent plasma clearance ranges from 12 to 47 L/hr (5th to 95th percentile; mean of 25 L/hr). Administration of olanzapine once daily leads to steady-state concentrations in about 1 week that are approximately twice the concentrations after single doses. Plasma concentrations, half-life, and clearance of olanzapine may vary between individuals on the basis of smoking status, gender, and age. Metabolism and Elimination â€” Following a single oral dose of 14C labeled olanzapine, 7% of the dose of olanzapine was recovered in the urine as unchanged drug, indicating that olanzapine is highly metabolized. Approximately 57% and 30% of the dose was recovered in the urine and feces, respectively. In the plasma, olanzapine accounted for only 12% of the AUC for total radioactivity, indicating significant exposure to metabolites. After multiple dosing, the major circulating metabolites were the 10-N-glucuronide, present at steady state at 44% of the concentration of olanzapine, and 4´-N-desmethyl olanzapine, present at steady state at 31% of the concentration of olanzapine. Both metabolites lack pharmacological activity at the concentrations observed. Direct glucuronidation and cytochrome P450 (CYP) mediated oxidation are the primary metabolic pathways for olanzapine. In vitro studies suggest that CYPs 1A2 and 2D6, and the flavin-containing monooxygenase system are involved in olanzapine oxidation. CYP2D6 mediated oxidation appears to be a minor metabolic pathway in vivo, because the clearance of olanzapine is not reduced in subjects who are deficient in this enzyme. Geriatric â€” In a study involving 24 healthy subjects, the mean elimination half-life of olanzapine was about 1.5 times greater in elderly (â‰¥65 years) than in non-elderly subjects (<65 years). Caution should be used in dosing the elderly, especially if there are other factors that might additively influence drug metabolism and/or pharmacodynamic sensitivity [see Dosage and Administration (2)]. In animal studies with olanzapine, the principal hematologic findings were reversible peripheral cytopenias in individual dogs dosed at 10 mg/kg (17 times the maximum recommended human daily oral dose on a mg/m2 basis), dose-related decreases in lymphocytes and neutrophils in mice, and lymphopenia in rats. A few dogs treated with 10 mg/kg developed reversible neutropenia and/or reversible hemolytic anemia between 1 and 10 months of treatment. Dose-related decreases in lymphocytes and neutrophils were seen in mice given doses of 10 mg/kg (equal to 2 times the maximum recommended human daily oral dose on a mg/m2 basis) in studies of 3 monthsâ€™ duration. Nonspecific lymphopenia, consistent with decreased body weight gain, occurred in rats receiving 22.5 mg/kg (11 times the maximum recommended human daily oral dose on a mg/m2 basis) for 3 months or 16 mg/kg (8 times the maximum recommended human daily oral dose on a mg/m2 basis) for 6 or 12 months. No evidence of bone marrow cytotoxicity was found in any of the species examined. Bone marrows were normocellular or hypercellular, indicating that the reductions in circulating blood cells were probably due to peripheral (non-marrow) factors. 1) In a 6-week, placebo-controlled trial (n=149) involving 2 fixed olanzapine doses of 1 and 10 mg/day (once daily schedule), olanzapine, at 10 mg/day (but not at 1 mg/day), was superior toplacebo on the PANSS total score (also on the extracted BPRS total), on the BPRS psychosis cluster, on the PANSS Negative subscale, and on CGI Severity. 2) In a 6-week, placebo-controlled trial (n=253) involving 3 fixed dose ranges of olanzapine (5 ± 2.5 mg/day, 10 ± 2.5 mg/day, and 15 ± 2.5 mg/day) on a once daily schedule, the 2 highest olanzapine dose groups (actual mean doses of 12 and 16 mg/day, respectively) were superior to placebo on BPRS total score, BPRS psychosis cluster, and CGI severity score; the highest olanzapine dose group was superior to placebo on the SANS. There was no clear advantage for the high-dose group over the medium-dose group. 3) In a longer-term trial, adult outpatients (n=326) who predominantly met DSM-IV criteria for Schizophrenia and who remained stable on olanzapine during open-label treatment for at least 8 weeks were randomized to continuation on their current olanzapine doses (ranging from 10 to 20 mg/day) or to placebo. The follow-up period to observe patients for relapse, defined in terms of increases in BPRS positive symptoms or hospitalization, was planned for 12 months, however, criteria were met for stopping the trial early due to an excess of placebo relapses compared to olanzapine relapses, and olanzapine was superior to placebo on time to relapse, the primary outcome for this study. Thus, olanzapine was more effective than placebo at maintaining efficacy in patients stabilized for approximately 8 weeks and followed for an observation period of up to 8 months. (1) In one 6-week placebo-controlled combination trial, 175 outpatients on lithium or valproate therapy with inadequately controlled manic or mixed symptoms (Y-MRS â‰¥16) were randomized to receive either olanzapine or placebo, in combination with their original therapy. Olanzapine (in a dose range of 5 to 20 mg/day, once daily, starting at 10 mg/day) combined with lithium or valproate (in a therapeutic range of 0.6 mEq/L to 1.2 mEq/L or 50 mcg/mL to 125 mcg/mL, respectively) was superior to lithium or valproate alone in the reduction of Y-MRS total score. (2) In a second 6-week placebo-controlled combination trial, 169 outpatients on lithium or valproate therapy with inadequately controlled manic or mixed symptoms (Y-MRS â‰¥16) were randomized to receive either olanzapine or placebo, in combination with their original therapy. Olanzapine (in a dose range of 5 to 20 mg/day, once daily, starting at 10 mg/day) combined with lithium or valproate (in a therapeutic range of 0.6 mEq/L to 1.2 mEq/L or 50 mcg/mL to 125 mcg/mL, respectively) was superior to lithium or valproate alone in the reduction of Y-MRS total score. Olanzapine orally disintegrating tablets 5 mg are yellow-colored, capsule-shaped tablets, flat on one side and concave on the other side, debossed with R-262 on the flat side and plain on the concave side and are supplied in bottles of 30, carton of 10 packs containing 10 tablets each, carton of 30 packs containing 1 tablet each and carton of 3 packs containing 10 tablets each. Olanzapine orally disintegrating tablets 10 mg are yellow-colored, capsule-shaped tablets, flat on one side and concave on the other side, debossed with R-263 on the flat side and plain on the concave side and are supplied in bottles of 30, carton of 10 packs containing 10 tablets each, carton of 30 packs containing 1 tablet each and carton of 3 packs containing 10 tablets each. Olanzapine orally disintegrating tablets 15 mg are yellow-colored, capsule-shaped tablets, flat on one side and concave on the other side, debossed with R-264 on the flat side and plain on the concave side and are supplied in bottles of 30, carton of 10 packs containing 10 tablets each, carton of 30 packs containing 1 tablet each and carton of 3 packs containing 10 tablets each. Olanzapine orally disintegrating tablets 20 mg are yellow-colored, capsule-shaped tablets, flat on one side and concave on the other side, debossed with R-265 on the flat side and plain on the concave side and are supplied in bottles of 30, carton of 10 packs containing 10 tablets each, carton of 30 packs containing 1 tablet each and carton of 3 packs containing 10 tablets each. Store olanzapine orally disintegrating tablets at controlled room temperature, 20° to 25°C (68° to 77°F) [see USP]. The USP defines controlled room temperature as a temperature maintained thermostatically that encompasses the usual and customary working environment of 20° to 25°C (68° to 77°F); that results in a mean kinetic temperature calculated to be not more than 25°C; and that allows for excursions between 15° and 30°C (59° and 86°F) that are experienced in pharmacies, hospitals, and warehouses. See the FDA-approved Medication Guide for the oral formulations. Olanzapine is not approved for elderly patients with dementia-related psychosis [see Boxed Warning andWarnings and Precautions (5.1)]. Patients should be advised of the potential risk of hyperglycemia-related adverse reactions. Patients should be monitored regularly for worsening of glucose control. Patients who have diabetes should follow their doctorâ€™s instructions about how often to check their blood sugar while taking olanzapine [see Warnings and Precautions (5.5) ]. Patients should be counseled that dyslipidemia has occurred during treatment with olanzapine. Patients should have their lipid profile monitored regularly [see Warnings and Precautions (5.5) ]. Patients should be counseled that weight gain has occurred during treatment with olanzapine. Patients should have their weight monitored regularly [see Warnings and Precautions (5.7) ]. Patients should be advised of the risk of orthostatic hypotension, especially during the period of initial dose titration and in association with the use of concomitant drugs that may potentiate the orthostatic effect of olanzapine, e.g., diazepam or alcohol [see Warnings and Precautions (5.8)and Drug Interactions (7)]. Patients should be advised to change positions carefully to help prevent orthostatic hypotension, and to lie down if they feel dizzy or faint, until they feel better. Patients should be advised to call their doctor if they experience any of the following signs and symptoms associated with orthostatic hypotension: dizziness, fast or slow heart beat, or fainting. Patients should be advised to inform their physicians if they are taking, or plan to take, Symbyax® (olanzapine and fluoxetine hydrochloride). Patients should also be advised to inform their physicians if they are taking, plan to take, or have stopped taking any prescription or over-the-counter drugs, including herbal supplements, since there is a potential for interactions [see Drug Interactions (7)]. Olanzapine orally disintegrating tablets contains phenylalanine (0.75, 0.75, 1.125, or 1.5 mg per 5, 10, 15, or 20 mg tablet, respectively). [see Description (11)]. Pregnancy â€” Patients should be advised to notify their physician if they become pregnant or intend to become pregnant during threrapy with olanzapine [see Use in Specific Populations (8.1)]. Symbyax® (olanzapine and fluoxetine hydrochloride) is a trademark of Eli Lilly company. 1. Increased risk of death in elderly people who are confused, have memory loss and have lost touch with reality (dementia-related psychosis). 2. High blood sugar (hyperglycemia). 3. High fat levels in your blood (increased cholesterol and triglycerides), especially in teenagers age 13 to 17, or when used in combination with fluoxetine in children age 10 to 17. 4. Weight gain, especially in teenagers age 13 to 17, or when used in combination with fluoxetine in children age 10 to 17. 1. Increased risk of death in elderly people who are confused, have memory loss and have lost touch with reality (dementia-related psychosis). Olanzapine orally disintegrating tablets are not approved for treating psychosis in elderly people with dementia. 4. Weight gain. Weight gain is very common in people who take olanzapine orally disintegrating tablets. Teenagers (13 to 17 years old) are more likely to gain weight and to gain more weight than adults. Children (10 to 17 years old) are also more likely to gain weight and to gain more weight than adults when olanzapine is used in combination with fluoxetine. Some people may gain a lot of weight while taking olanzapine orally disintegrating tablets, so you and your doctor should check your weight regularly. Talk to your doctor about ways to control weight gain, such as eating a healthy, balanced diet, and exercising. episodes of depression that happen with bipolar I disorder, when used with the medicine fluoxetine (Prozac®), in people age 10 or older. Olanzapine orally disintegrating tablets have not been approved for use in children under 13 years of age. Olanzapine in combination with fluoxetine has not been approved for use in children under 10 years of age. What should I tell my doctor before taking olanzapineorally disintegratingtablets? are breast-feeding or plan to breast-feed. Olanzapine can pass into your breast milk and may harm your baby. You should not breast-feed while taking olanzapine orally disintegrating tablets. Talk to your doctor about the best way to feed your baby if you take olanzapine orally disintegratingtablets. The symptoms of Bipolar I Disorder or schizophrenia may include thoughts of suicide or of hurting yourself or others. If you have these thoughts at any time, tell your doctor or go to an emergency room right away. Tell your doctor about all the medicines that you take, including prescription and non-prescription medicines, vitamins, and herbal supplements. Olanzapine orally disintegrating tablets and some medicines may interact with each other and may not work as well, or cause possible serious side effects. Your doctor can tell you if it is safe to take olanzapine orally disintegrating tablets with your other medicines. Do not start or stop any medicine while taking olanzapine orally disintegrating tablets without talking to your doctor first. How should I take olanzapineorally disintegrating tablets? To prevent serious side effects, do not stop taking olanzapine orally disintegrating tablets suddenly. If you need to stop taking olanzapinetablets, your doctor can tell you how to safely stop taking it. If you take too much olanzapineorally disintegratingtablets, call your doctor or poison control center at 1-800-222-1222 right away, or get emergency treatment. Call your doctor if you do not think you are getting better or have any concerns about your condition while taking olanzapine orally disintegrating tablets, . What should I avoid while taking olanzapineorally disintegrating tablets? What are the possible side effects of olanzapineorally disintegrating tablets? Drug Reaction with Eosinophilia and Systemic Symptoms (DRESS): DRESS can occur with olanzapine. Features of DRESS may include rash, fever, swollen glands and other internal organ involvement such as liver, kidney, lung and heart. DRESS is sometimes fatal; therefore, tell your doctor immediately if you experience any of these signs. Seizures : Tell your doctor if you have a seizure during treatment with olanzapine orally disintegrating tablets. Tell your doctor about any side effect that bothers you or that does not go away.These are not all the possible side effects with olanzapine orally disintegrating tablets. For more information, ask your doctor or pharmacist. How should I store olanzapineorally disintegrating tablets? This Medication Guide summarizes the most important information about olanzapine orally disintegrating tablets. If you would like more information, talk with your doctor. You can ask your doctor or pharmacist for information about olanzapine orally disintegrating tablets that was written for healthcare professionals. For more information about olanzapine orally disintegrating tablets call 1-888-375-3784. Orally Disintegrating Tablets â€” aspartame, colloidal silicon dioxide, crospovidone, magnesium stearate, mannitol, microcrystalline cellulose and guar gum (Avicel CE-15), microcrystalline cellulose (Avicel PH 101), microcrystalline cellulose (Avicel PH 112), pregelatinized starch and sodium lauryl sulphate.